Below you'll find uses for hydrogen peroxide for cleaning, laundry and stain removal that have been submitted by other readers, or recipes for homemade cleaners that feature this natural cleaning supply. You can also share your own tips and uses. With a need to save money and also for environmental reasons, more and more people are making their own cleaning products. However, when you are new to making your own products you can feel a bit nervous about which recipes and uses will actually work or not. The 3% solution of hydrogen peroxide, which is the kind you get in the brown bottle for first aid (not the stronger version sometimes used for hair bleaching) is often used in recipes for homemade cleaners and homemade stain removers. The reason is that hydrogen peroxide is a natural bleaching agent. It also has the advantage of being inexpensive, so it is useful when you are trying to save money by making your own cleaning products. I would love to hear your cleaning recipes and tips for hydrogen peroxide use in cleaning your home, your laundry and for removing stains below. No ideas or uses of your own to share? No problem. You can skip down to read hydrogen peroxide ideas and uses already submitted here. In addition, here is book, The Magic Of Hydrogen Peroxide , that you can read on your Kindle that provides even more ideas and uses. 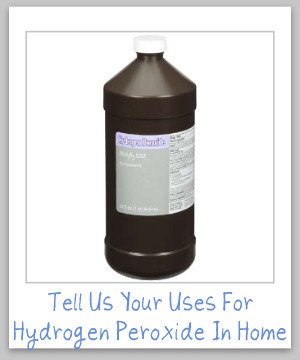 What Are Your Uses For Hydrogen Peroxide Around Your Home? Making and using your own cleaning products is becoming quite popular. One of the most common homemade cleaning supplies is hydrogen peroxide. How do you use hydrogen peroxide around your home for cleaning or stain removal? 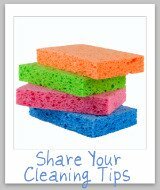 You can also share your recipes for homemade cleaning solutions which feature hydrogen peroxide here. Click the links below to see uses for hydrogen peroxide for around the home which have already been submitted by others. Feel free to comment on any of these submissions to tell us whether you use hydrogen peroxide in a similar way, or about any other thoughts you have.